1775. 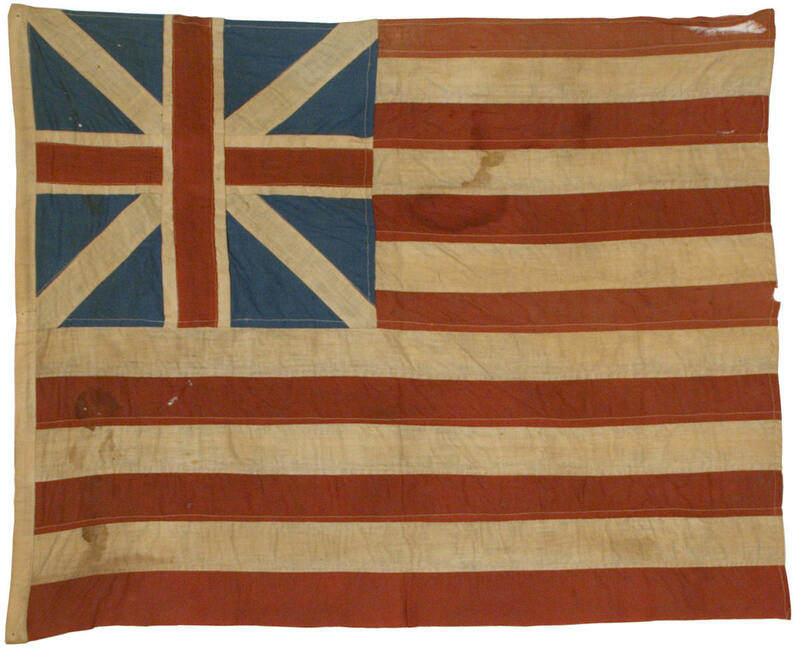 The colonies adopt the flag known as the Continental Colors or Grand Union flag, which becomes the first national flag of the United States. 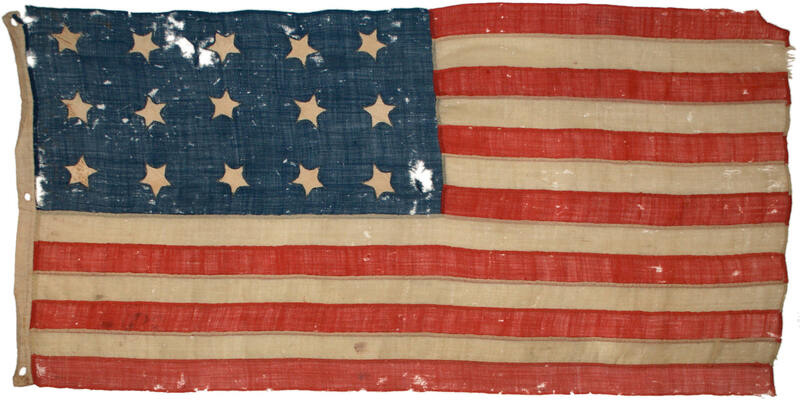 First documented as raised by John Paul Jones on December 3, 1775, it is in use at the time of the signing of the Declaration of Independence on July 4, 1776. 1818. 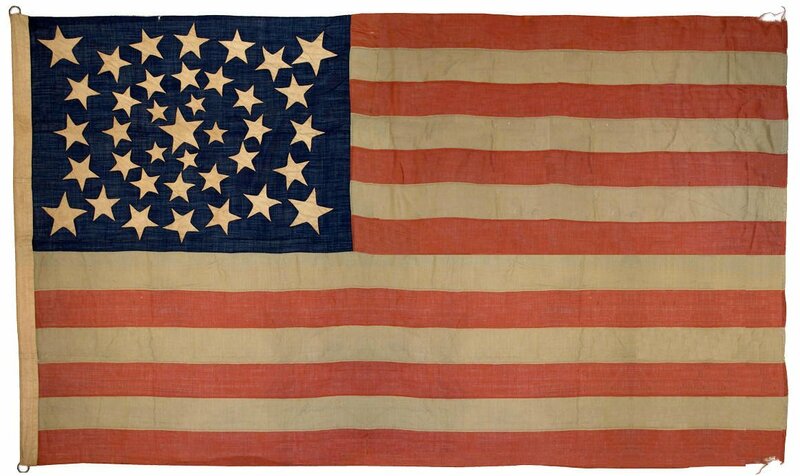 The third flag act, "That from and after the fourth day of July next, the flag of the United States be thirteen horizontal stripes, alternate red and white: that the union be twenty stars, white in a blue field. And be it further enacted, That on the admission of every new state into the Union, one star be added to the union of the flag; and that such addition shall take effect of the fourth day of July then next succeeding such admission." 1862. 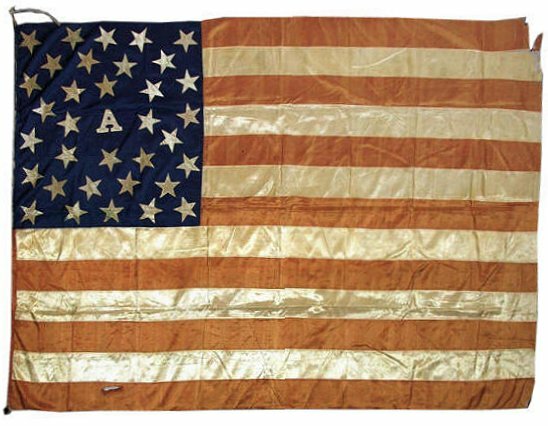 President Abraham Lincoln urges Americans to not remove stars from the flag, saying "I would rather be assassinated than see a single star removed from the flag." 1912. 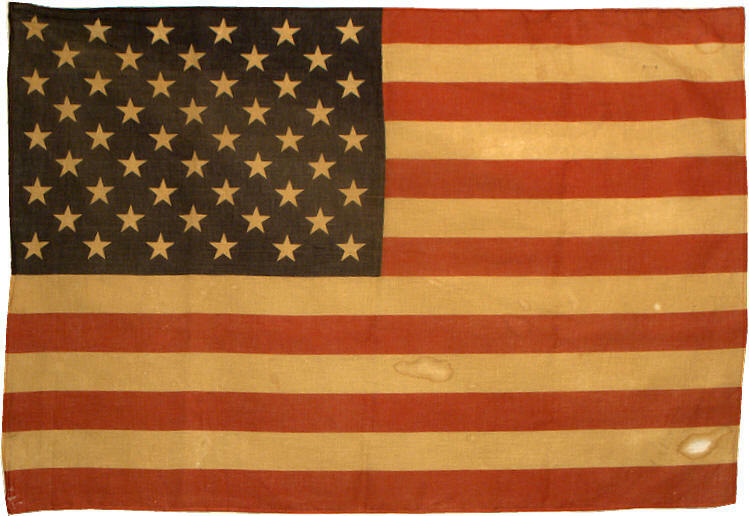 President Taft issues Executive Order dated June 24, 1912, which established the proportions of the flag and an arrangement of six horizontal rows of eight stars each for a total of 48. The era of unbridled creativity in flag making comes to an end. 1959-1960. Alaska and Hawaii are admitted to the Union, bringing our total states to 50, where it has remained for more than half a century. 2003. 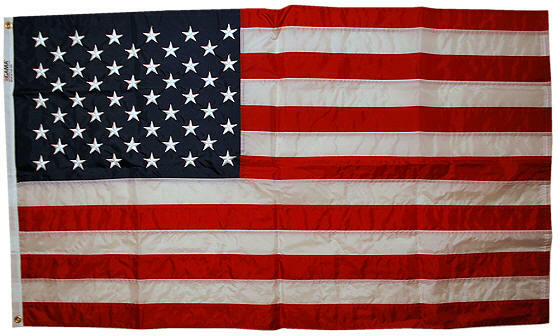 Flag of 50 Stars flown over Afghanistan during Operation Enduring Freedom, November 21, 2003. 1777. 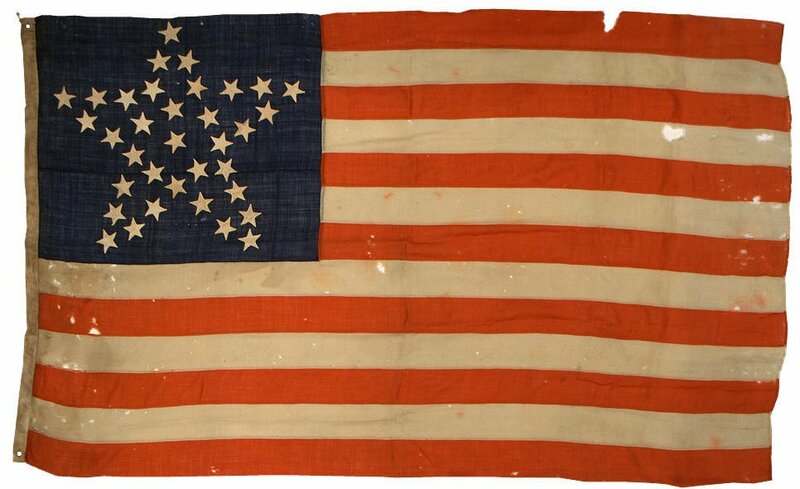 The first flag act, "Resolved, That the flag of the United States be made of thirteen stripes, alternate red and white; that the union be thirteen stars, white in a blue field, representing a new Constellation." 1837. 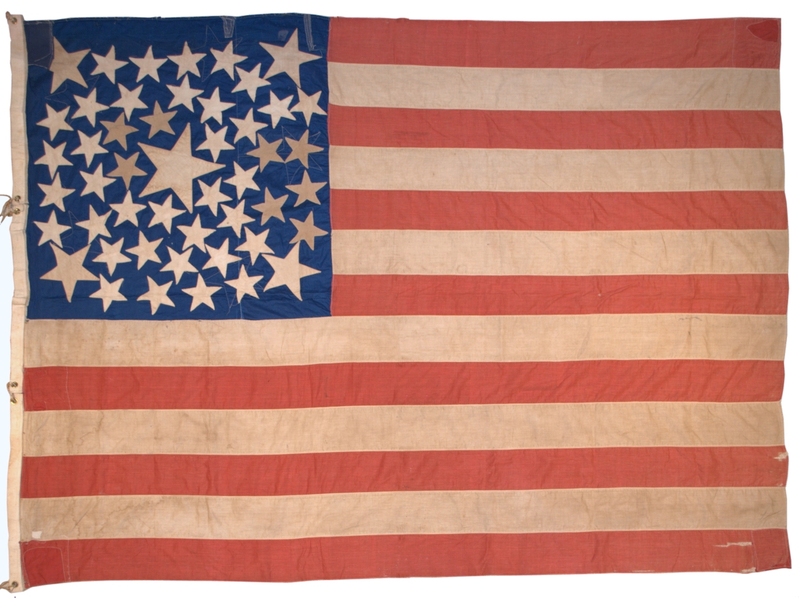 The "Great Star" Pattern gains in popularity. The first printed parade flags are produced. 1876. During the Centennial Celebrations of 1876 Americans make grand flags to celebrate 100 years of independence from Great Britain 1918. 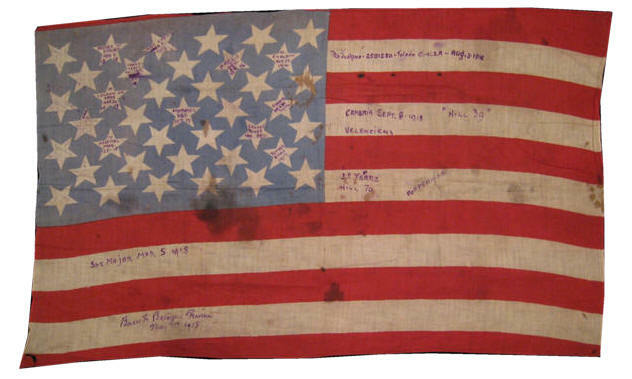 Some soldiers carry personal flags to the battlefields of World War I, such as this flag carried by Private Francis P. Judkins. 1976. 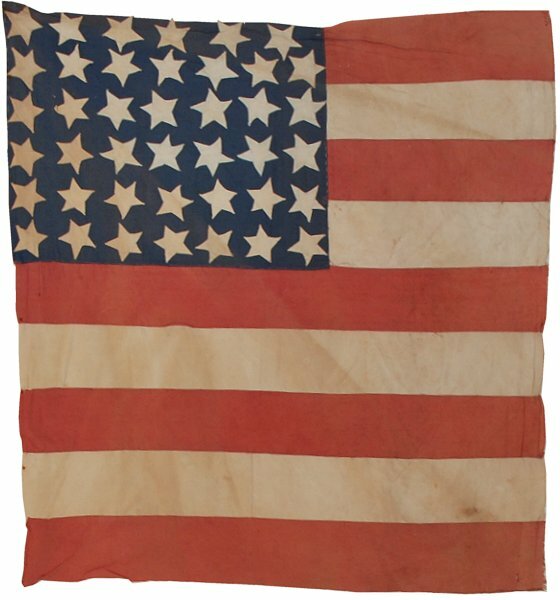 Americans once again make homemade flags to celebrate the American Bicentennial. Many are made in the forms and styles of the thought to be from the earliest years of the republic. 1794. 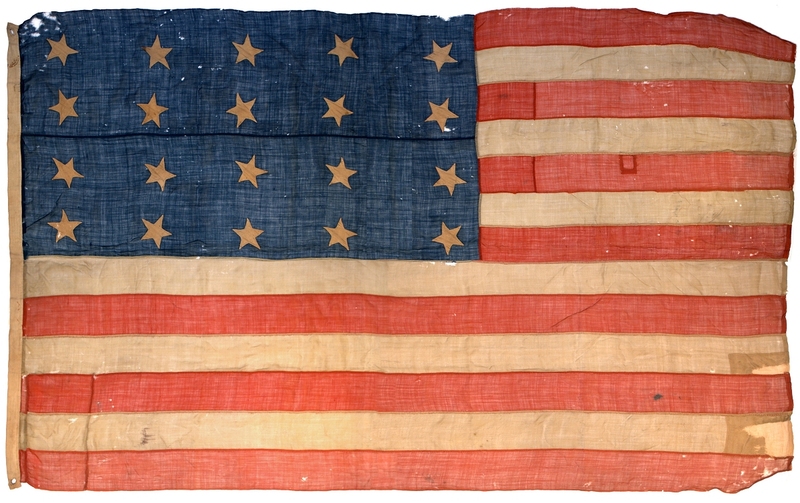 The second flag act, "That the flag of the United States be fifteen stripes, alternate red and white and that the union be fifteen stars, white in a blue field." 1861. 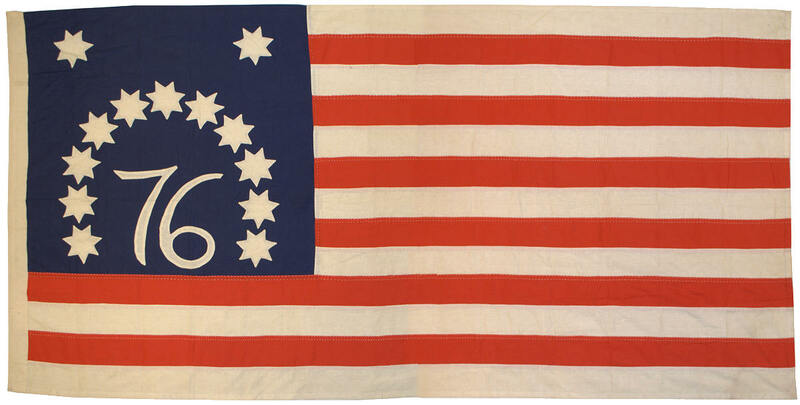 The Civil War leads to a surge in patriotism and in flag production. 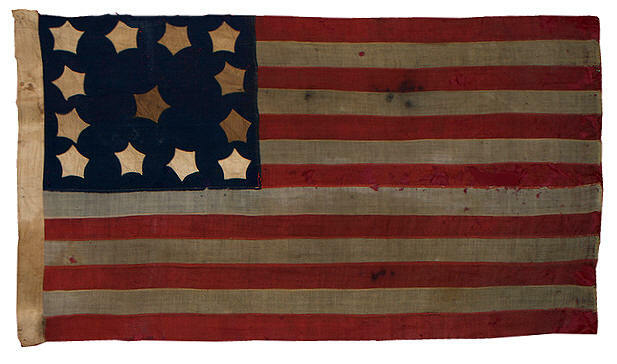 99% of surviving flags from the 19th century are from the Civil War period or later. 1892. 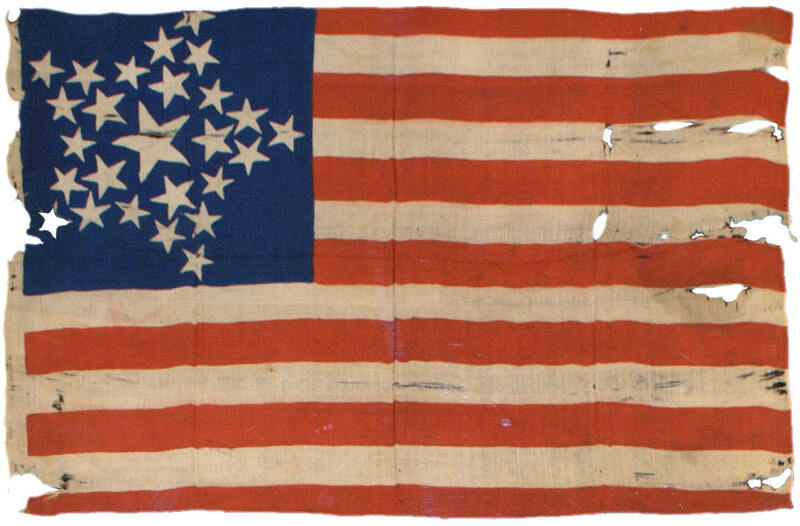 Henry Bowman, an African American, patents the process for affixing stars to flags using a zig-zag stitch. 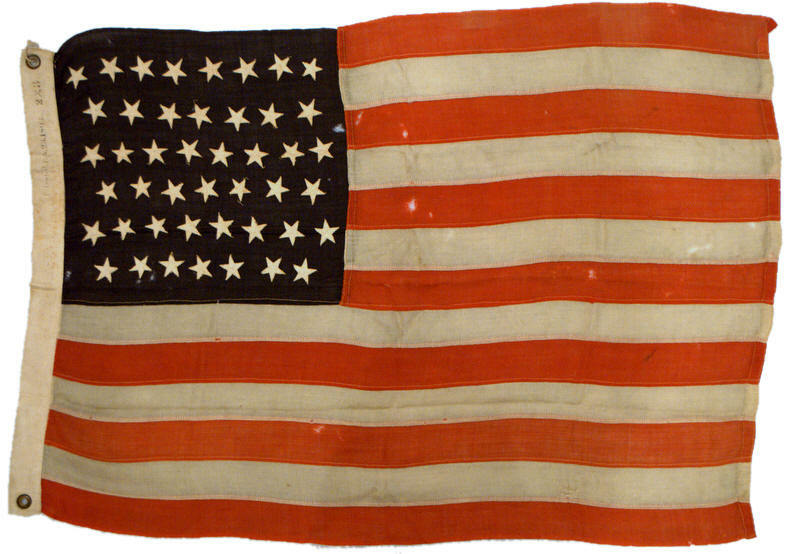 The flag pictured was produced by Bowman's flag company. 1944. Whimsical liberation flags are made in France, Belgium, and other countries liberated by allied forces from Nazi Germany during World War II. 2001. 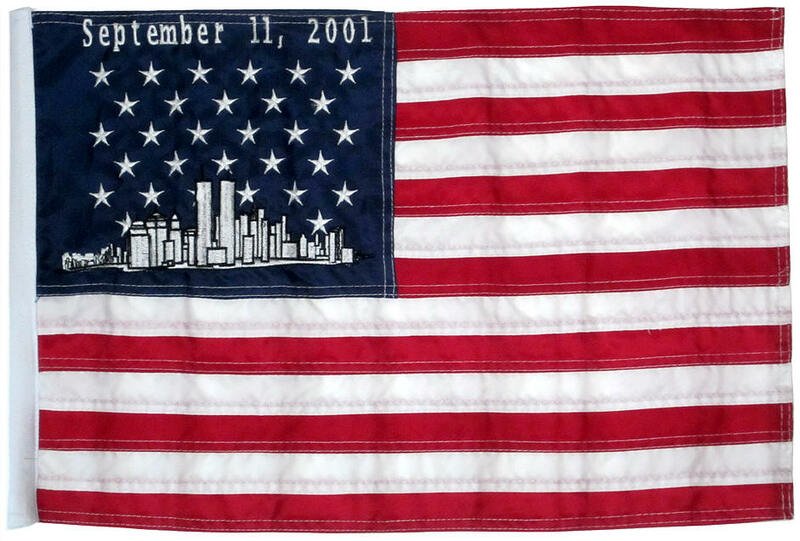 Americans demonstrate new found patriotism for the flag after the attacks on the World Trade Center on September 11, 2001.